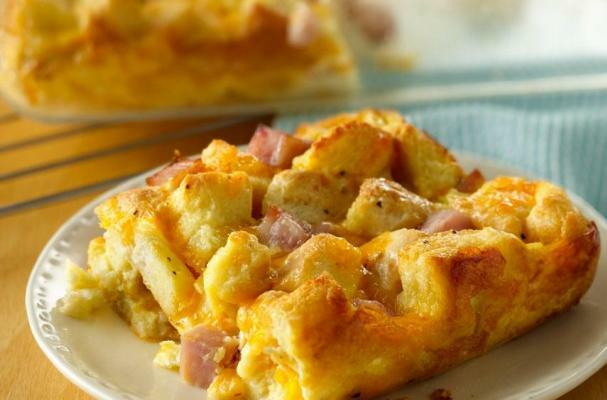 Ham biscuit strata is the Italian version of a breakfast casserole. Chopped ham is combined with leftover biscuits and eggs and baked in the oven. You can add other ingredients to your strata including olives, roasted red peppers, cheese and fresh herbs. This is also a great recipe to make with Easter leftovers. Cut each biscuit into 1-inch pieces. In medium bowl, beat eggs, milk and pepper with whisk until blended. Stir in ham, cheese and biscuit pieces. Let stand 5 minutes. Spoon mixture into greased or sprayed 8x4- or 9x5-inch (1 1/2-quart) glass loaf dish.